Henry Cavendish conducting his experiment with the torsion balance. Henry Cavendish (October 10, 1731 - February 24, 1810) was a British scientist best known for being the first to measure the average density of the earth using the gravitational theories of Isaac Newton. He also showed that water was a compound composed of oxygen and hydrogen, and identified hydrogen as a gas with specific properties. Henry Cavendish was born on October 10, 1731, in Nice, France, where his family was living at the time. His mother was Lady Anne Gray, daughter of the Duke of Kent and his father was Lord Charles Cavendish, son of the second Duke of Devonshire. The family traces its lineage across eight centuries to Norman times and was closely connected to many aristocratic families of Great Britain. When Cavendish was two, his mother died soon after the birth of his brother, leaving only his father to care for him. At age 11, Cavendish was a pupil at Dr. Newcome's School in Hackney. At age 18 (in 1749), he entered Cambridge in St Peter's College (now known as Peterhouse). He left four years later without graduating. His first paper, Factitious Airs, appeared 13 years later. Cavendish lived with his father in London, where they had three residences. His father had built a laboratory in one of these, and was himself known as an experimenter and a member of the Royal Society. It was from this laboratory that Cavendish did most of his work and made his important discoveries. The family was wealthy, and used their funds to outfit the laboratory with the requisite equipment and resources. Cavendish was silent and solitary, viewed as somewhat eccentric, and formed no close personal relationships outside his family. By one account, Cavendish had a back staircase added to his house in order to avoid encountering his housekeeper because he was especially shy of women. The contemporary accounts of his personality have led some modern commentators, such as Oliver Sacks, to speculate that he had Asperger's syndrome, though he may have been merely painfully shy. Because of his asocial and secretive behavior, he often avoided publishing his work, and much of his findings were not even communicated to his fellow scientists. Cavendish was thought of highly by his peers in the scientific community. He was elected to the membership of the Royal Society of London in 1760, and received the society's Copley Medal for his 1766 submission, Three Papers Containing Experiments on Factitious Airs. Cavendish's father died in 1783. Cavendish's 1784 paper, Experiments on Air, describes the synthesis of water from oxygen and hydrogen. A year later, he demonstrated that air is composed of oxygen, nitrogen, and a small percentage of then-unknown gases. In 1798, he submitted his famous paper, Experiments to Determine the Density of the Earth, employing a tortion balance to measure the gravitational attraction between two massive spheres of heavy metal. Cavendish's only social outlet was his membership of the Royal Society Club, whose members dined together before weekly meetings. Cavendish seldom missed these meetings. Cavendish died in his home in London on Feb. 24, 1810. While Cavedish left none of his fortune to finance scientific research, his relative by descent, William Cavendish, 7th Duke of Devonshire (Chancellor of the University from 1861 to 1891), donated money that was used to endow the Cavendish Laboratory at Cambridge University in the 1870s. It wasn't until the late nineteenth century that physicist James Clerk Maxwell was appointed by Cavendish's heirs to edit and annotate his electrical researches. He found that credit for most of his discoveries had already been given to others. Cavendish is also credited with one of the earliest accurate calculations of the density of the earth. He published his results in the Philosophical Transactions of the Royal Society of London. The apparatus used was actually designed and built by geologist John Michell, who died before he could begin the experiment. The apparatus was sent in crates to Cavendish, who after making some improvements to Michell's design, completed the experiment in 1797. 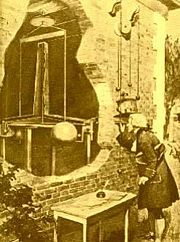 The apparatus consisted of a torsion balance to measure the gravitational attraction between two 350 pound lead spheres. There is the common mistake in History of Science to affirm that Cavendish calculated Newton's gravitational constant, G. This mistake has been pointed out by several authors although it appears in most of the physics textbooks. In reality, Cavendish wanted to estimate the earth's density relative to that of water. His accurate results were reinterpreted later to calculate G. The first time that this constant was ever used was almost 100 years after the Cavendish experiment, in 1873. His results were also used to calculate Earth’s mass and remained the accepted standard until the twentieth century. The current best estimate for the Earth's mass is 5.9725 billion trillion tons, a difference of only about 1 percent from Cavendish's measurements. The concept of electric potential, which he called the "degree of electrification"
Cavendish discovered that when hydrogen and oxygen are enclosed in a tube, and the reaction between them triggered by a spark, water vapor condenses on the sides of the tube. He calculated the weights of each gas, and showed that it was equal to the weight of the water formed. James Watt similarly noticed that the combination of hydrogen and oxygen forms water vapor, and for a time, the two scientists fought over priority of the discovery. They are said to have come to an amicable agreement that Cavendish published the discovery first. Cavendish established an accurate measure of the composition of the earth's atmosphere. He synthesized nitric acid by mixing nitrogen, oxygen, and water and subjecting them to an electric spark. He studied the properties of the torpedo, a fish that communicates an electric shock, and showed that one of the contaminants in hard water was calcium carbonate. Cavendish also investigated the nature of heat, and measured the specific heat of several substances. He also concluded important investigations on the properties of gases. ↑ Bill Bryson, The Size of the Earth: A Short History of Nearly Everything (2003). ↑ A. Cornu and J.B. Baille, Mutual determination of the constant of attraction and the mean density of the earth, C.R. Acad. Sci., Paris Vol. 76, 954-958. This page was last modified on 5 November 2008, at 18:48.